With a comfortable, electronically programmable time-switch. Who wouldn’t, after a hard day’s work, enjoy simply sitting at the table and relaxing.The new Steamer – Stöckli gets up “Steam” for a healthy cooking method. 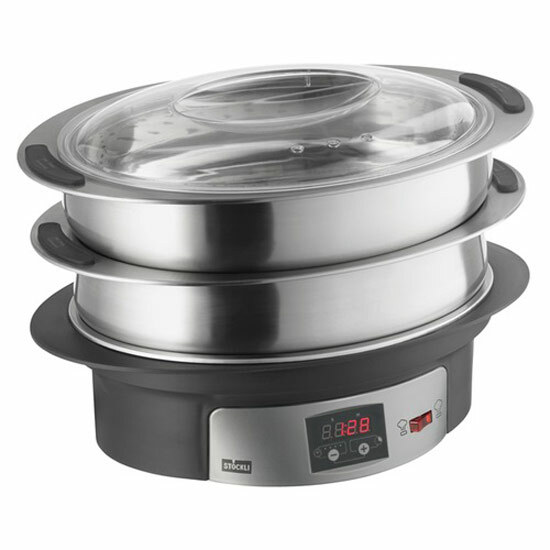 The gentle steamer for the wholesome, natural and tasty home kitchen. With comfortable, electronically programmable timer, 2 strainer made of stainless steel with silicone handles, plastic lid Capacity sieves 4 per liter, heating container from-clean stainless steel with 1.5 liter capacity.